Could a major scandal cause the United States to terminate its support for Israel? 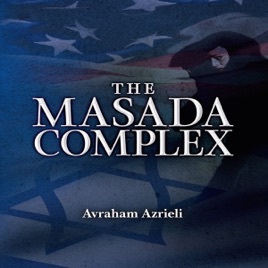 The Masada Complex, a contemporary thriller set in Arizona, Washington, and Israel, gives us a chilling portrayal of exactly such a scenario. The novel's unforgettable hero is Masada El-Tal, a beautiful Israeli expatriate who grew up on a kibbutz by the Dead Sea and served in an IDF elite unit. But her charmed life was struck by disaster after 25 years. She left Israel for Arizona and has built a new life, earning a reputation as a prizewinning investigative reporter. But her latest story causes the suicide of a US senator, and an unprecedented wave of anti-Semitic violence sweeps across America. While an angry Congress prepares to enact legislation to suspend all military aid to Israel, a mysterious organization attempts to assassinate Masada in order to stop her relentless investigation. As the clock ticks, her friends turn out to be enemies, and those she has maligned come to her aid. And the truth Masada uncovers exceeds her worst nightmares. Like the Jewish homeland she has left, Masada must overcome her moral dilemmas in order to defeat her mortal foes and save her people from destruction.